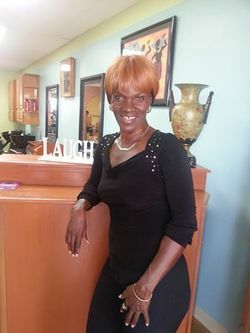 Elaine Bell is a Fort Pierce, Fla.-based hairstylist and color specialist. With more than 25 years of industry experience, she has noticed one thing remains the same: stylists MUST shift with the trends. Born and raised in Jamaica, Elaine attended beauty school in New York City and continued her education and training nationally and internationally. She's traveled to cities across the United States and Europe attending classes, tradeshows, and learning from some of the hair industry's best. She has never stopped learning. More than anything else, Elaine prides herself on her ability to cater to all types of people. After all, diversity is beautiful; it’s something to be celebrated. No matter how long, short, dark, red, thick, thin, course, curly, unruly, or damaged hair may be, Elaine turns no one away. She is a risk taker, but also a people pleaser. She’s an industry veteran, but up to date on the latest trends and styles. And most importantly, she values each person that walks through her beauty salon door and makes sure each person leaves with their chin a little higher.